I’m still on the fence with the CDA craze. On one hand, I’m one of those guys that loves messing with a good thing as long as the new thing is as good if not better than the original. I love IPA’s, so any chance to mess around with them to bring out something cool in the flavor profile is fine with me. On the other hand, I’ve been around the block a few times and had my fair share of weak CDA’s that are really just bland IPA’s with some masked roasted notes. Boring. I originally warmed to the name “Black IPA” because I thought it perfectly described the style. The one’s I had tried were just that – Black IPA’s -IPA in body and flavor, just black in color. Now that I’ve had some better beers from the style I’ve come around on the Cascadian Dark Ale nomenclature. I don’t consider them IPA’s and the best of the style shouldn’t resemble an IPA at all. They deserve to be their own style. On that note, let’s review a CDA with “Black India Pale Ale” on the label. Wait, what was my point on that CDA thing? APPEARANCE: Weird, it’s black. Who knew? HEAD: Thick, luscious tan head atop the blackness. Woops, there it goes, head did not last long. LACING: Not much, just some faint lacing around the top of the glass that dissipates quickly. TASTE: First thing that hit me was a rush of piny hops but that was immediately quenched by a sweet, malty backbone. Bitterness comes through more as roasted coffee than any puckering hops. It’s hoppy for sure, but hoppy in the way of an Imperial Stout and not an Imperial IPA. Me likes. Here’s how I would describe the Peak Organic Hop Noir. If you took a Sam Smith’s Nut Brown Ale, poured some Green Flash West Coast IPA in the glass, then topped it with Berkshire’s Coffeehouse Porter, you might have the perfect pre-mixed Cascadian Dark Ale. That’s what it tasted like to me anyway. 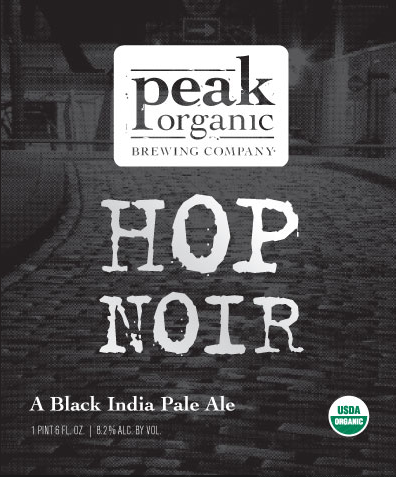 Posted in Tasting Notes.Tagged 3.5 Hops, Black IPA, Cascadian Dark Ale, CDA, Hop Noir, Maine, Peak Organic, Portland. Am I correct in stating Peak Organic is contract brewed? I believe they are contract brewed out of Shipyard. Seems like a similar case as Clown Shoes though – just using the fantastic infrastructure of Shipyard to have them brew something that is wholly created and owned by Peak. I think this is a case of good contract brewing, not some marketing company that contracts out to someone like Saranac to handle every aspect of the beer process from recipe to brewing to shipment. Peak Organic gave us a ton of free beer to sponsor a fundraising New Year’s Eve event I did for the DREAM program in Boston a few years back. Really cool of them. Sounds pretty good. I think this is the best CDA I’ve had so far. Shipyard, another fine beverage does brew peak.. still good stuff. I am from Maine and will be traveling back to the source this summer to taste the freshness. However, gritty Mcduff’s is the total experience. They made top beer in Draft magazine last month for the brown ale. Right in the heart of Portland and you drink in the bar right on top of the brew kettles. It’ like hatching a little tasty beer whenever you are there. Plus the chilly made with their beer is kick-in. Go forth and sample! I think Deschutes Hop in the Dark is still my favorite CDA, though Hopworks Secession CDA is damn good too. Previous Post BUTTERNUTS? BETTER NOT.